The Dodge Viper has been out of production since 2010 but fortunately, for all the enthusiasts out there Dodge has not spend the last two years doing nothing and are in fact going to revive the legacy with the fifth generation Dodge SRT Viper 2013. Let's take a look at what we can expect from this highly anticipated comeback. 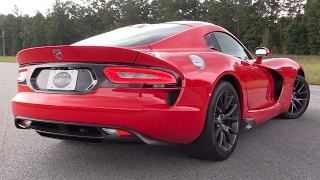 Underneath its bonnet the Dodge SRT Viper 2013 sports the same 8.4 liter V10 we've seen before on the earlier models. 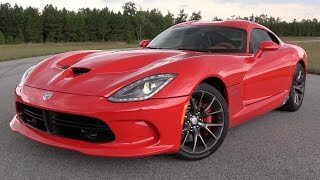 The hand-built all-aluminum naturally aspired engine is now able to deliver 640 horsepower @ 6150 rpm and 600 lb-ft of torque @ 4950 rpm, which is quite impressive and makes the new Dodge SRT Viper 2013 the sports car with the most torque in the world, for a naturally aspired engine. To keep the performance up and the weight down an ultra-light flow and lightweight composite intake manifold has been fitted on the new Viper, alongside sodium-filled exhaust valves, high strength forged pistons, an aluminum flywheel and a new catalyst. The engine is paired up with a TR6060 six-speed manual gearbox featuring an improved short-throw shifter. You may wonder whether or not Dodge has improved anything else besides the engine and powertrain, and the answer is definitely yes. Fact of the matter is, the new Dodge SRT Viper draws many aspects from the previous GTR-S race cars and as a result, the new Dodge SRT Viper boasts 50% increase in torsional stiffness compared to its predecessors. To keep the Dodge SRT Viper in line, the car has been fitted with Pirelli P Zero tires and aBrembo braking package featuring fixed-aluminum calipers and 355mm vented disk brakes at all four wheels. Standard safety features include traction control, a new 4-channel anti-lock brake system and multistage stability control. The Dodge SRT Viper 2013 undergone notable changes on the exterior, the most notable features being the front end where the SRT 2013 received a more stylish and aggressive look featuring a completely redesigned front/rear bumper and head/tail lights. The overall shape and other key features have been maintained in order for the new Dodge to retain its Viper identity and heritage. Needless to say, the entire interior of the Dodge SRT Viper 2013 has been redesigned in order deliver new standards of equipment and comfort. Premium materials have been used and overall the new SRT Viper offers a more attractive and up to date interior design. The sporty DNA has been retained and the interior feels as if it's focusing on giving the driver a sporty, driver-focused cockpit-style layout. Unfortunately at this early stage both the price and the exact launch date of the Dodge SRT Viper 2013 are unknown, but you can expect the fifth generation Viper to hit the market later this year, when it will be given the opportunity to compete against its most fierce competitors including the 2012 Chevrolet Corvette ZR1, the flamboyant 2011 Lamborghini Aventador LP700-4 or the 2012 Porsche 911 Carrera S.